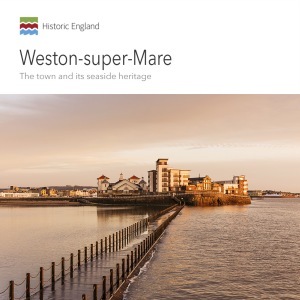 Two centuries ago Weston-super-Mare was a small, rarely visited village but its location alongside the Severn Estuary soon made it a convenient bathing place for the wealthy inhabitants of Bristol and Bath. Once the railway arrived in 1841, the handful of brave sea bathers became thousands of day trippers in search of fun and sunshine. Weston also became popular with excursionists and holidaymakers arriving by steamer from South Wales. To cater for all these visitors, the small entertainment and bathing facilities enjoyed by the wealthy Georgian elite were replaced by larger, more popular facilities, including two piers, Winter Gardens, a large swimming bath and a substantial open-air pool. Weston is not only a busy seaside resort, but a popular place to live. During the 19th century its population rose from around 100 to almost 20,000 and its handful of small, fisherman’s cottages became a sea of terraces, crescents and villas constructed using the local stone. A distinctive type of villa emerged in Weston, different from those found at either of its larger neighbours. This was in large part due to Hans Fowler Price, the town’s leading architect for more than half a century from 1860 until his death in 1912. The book celebrates the complex history and colourful heritage of the town. It also looks to the future to examine how its 200-year story might contribute to a prosperous future.